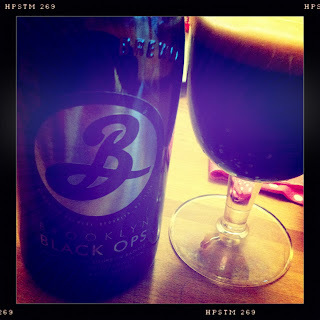 Wandering around southwest Florida a few months ago, I came across a bottle of Brooklyn Brewery’s Black Ops 2012 and put it in my shopping cart without giving it much thought. I’d never heard of it before, but I just knew it was going to be good, so why waste time deliberating? Little did I understand, however, just how lucky I was to find it. Apparently, they only make about a thousand bottles of Black Ops a year, and even friends in Brooklyn couldn’t get their hands on one. How it landed in Fort Myers is beyond me -- some top secret logistics, no doubt. But whatever, I’m not complaining. We brought it back home to Brussels and let it sit for a few weeks before sharing it with some guests one evening. Everyone was hugely impressed. Black Ops is a stout that’s aged in bourbon barrels, and the taste is precisely that, and much more. Beurre noisette fades into caramel and cuberdons, a raspberry-flavoured Belgian candy that’s rarely found outside this country, with hints of liquorice. It’s thick and bitter and just painfully good.